Conan Doyle was born on 22 May 1859 in Edinburgh. As a young man, he studied medicine at the University of Edinburgh. While studying, Doyle began writing short stories, his earliest extant fiction being The Haunted Grange of Goresthorpe. His first work was as a ship’s surgeon. In 1882 he joined a medical practice in Plymouth, but soon left to set up an independent practice. The practice was initially not very successful, and while waiting for patients, Doyle again began writing fiction. 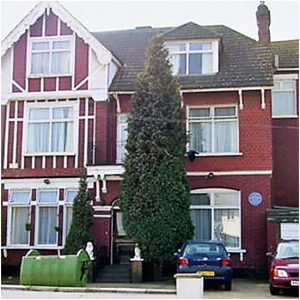 In 1890 Doyle studied ophthalmology in Vienna, and moved to London, first living in Montague Place and then in South Norwood. Doyle struggled to find a publisher for his work. His first work featuring Sherlock Holmes and Dr. Watson, A Study in Scarlet, was taken by Ward Lock & Co on 20 November 1886, giving Doyle £25 (£2,875, in 2015, or $4,279.44) for all rights to the story. A sequel to A Study in Scarlet was commissioned and The Sign of the Four appeared in February 1890. Short stories featuring Sherlock Holmes were subsequently published in the Strand Magazine. Doyle’s attitude towards his most famous creation was ambivalent. In November 1891 he wrote to his mother: “I think of slaying Holmes, … and winding him up for good and all. He takes my mind from better things.” His mother responded, “You won’t! You can’t! You mustn’t!” In an attempt to deflect publishers’ demands for more Holmes stories, he raised his price to a level intended to discourage them, but found they were willing to pay even the large sums he asked. As a result, he became one of the best-paid authors of his time. In December 1893, to dedicate more of his time to his historical novels, Doyle had Holmes and Professor Moriarty plunge to their deaths together down the Reichenbach Falls in the story “The Final Problem”. Public outcry, however, led him to feature Holmes in 1901 in the novel The Hound of the Baskervilles. 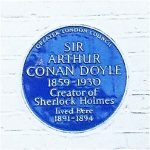 In 1903, Doyle published his first Holmes short story in ten years, The Adventure of the Empty House, in which it was explained that only Moriarty had fallen; but since Holmes had other dangerous enemies—especially Colonel Sebastian Moran—he had arranged to also be perceived as dead. Holmes was ultimately featured in a total of 56 short stories—the last published in 1927—and four novels by Doyle, and has since appeared in many novels and stories by other authors. Doyle amassed a portfolio of short stories and between 1888 and 1906 wrote seven historical novels, which he and many critics regarded as his best work. He also authored nine other novels, and later in his career (1912-1929) five stories, two of novella length, featuring the irascible scientist Professor Challenger. The Challenger stories include what is probably his best-known work after the Holmes oeuvre, The Lost World. He was a prolific author of short stories, including two collections set in Napoleonic times featuring the French character Brigadier Gerard. He also wrote for the stage. In 1885 Doyle married Mary Louise (sometimes called “Louisa”) Hawkins, the youngest daughter of J. Hawkins, of Minsterworth, Gloucestershire, and sister of one of Doyle’s patients. She suffered from tuberculosis and died on 4 July 1906. The following year he married Jean Elizabeth Leckie, whom he had first met and fallen in love with in 1897. He had maintained a platonic relationship with Jean while his first wife was still alive, out of loyalty to her. Doyle fathered five children – two with his first wife and three with his second wife. Doyle was also an active political campaigner, an army field doctor, stood for parliament twice and a fervent advocate of justice – he personally investigated two closed cases, which led to two men being exonerated of the crimes of which they were accused. He had a longstanding interest in mystical subjects and was also initiated as a Freemason. Following Louisa’s death in 1906, the death of his son Kingsley just before the end of the First World War, and the deaths of his brother and other family members, Doyle sank into depression. He found solace supporting spiritualism and its attempts to find proof of existence beyond the grave. Doyle died of a heart attack at the age of 71. His last words were directed toward his wife: “You are wonderful.” At the time of his death, there was some controversy concerning his burial place, as he was avowedly not a Christian, considering himself a Spiritualist. He was first buried on 11 July 1930 in Windlesham rose garden. He was later reinterred together with his wife in Minstead churchyard in the New Forest, Hampshire. The epitaph on his gravestone in the churchyard reads, in part: “Steel true/Blade straight/Arthur Conan Doyle/Knight/Patriot, Physician, and man of letters”.